Dr. Burright completed her veterinary medical degree from Oregon State University. Prior to becoming a veterinarian she spent many years in veterinary medicine. Her first role started in 1986 as a kennel attendant in an after school position before serving in many additional roles, including certified veterinarian technician and practice manager. medicine. Dr. Burright is dedicated to the compassionate care, health and well-being of her patients! She brings a unique background and abilities to our clinic, having been raised around a working farm, her extensive veterinary experience, and practice management. It is of great importance to Dr. Burright to create a trusting relationship in order to provide the best care possible as this is her passion and life mission. Dr. Burright is a native Oregonian. She enjoys spending time with family and friends including her husband, two children, two labrador retrievers, and two cats. Her family has fostered many animals over the years, most recently they said goodbye to their rescue guinea pig “Nae Nae”. Outside of work you can find her spending time with family, friends, traveling, and motorcycling. Dr. Smith also obtained her degree in veterinary medicine from the University of Minnesota in 1980. She has worked at Oak Hills Veterinary Clinic for the past 25 years. Prior to that, she served as an emergency veterinarian for 8 years. Her special interests in the veterinary field include feline health, ultrasound, and dentistry. Dr. Smith is passionate about continuing her education in veterinary medicine and works hard to stay up to date with the most recent advances in order to offer the most excellent care to patients. She devotes time each week to reading and attending continuing education courses. Dr. Smith also belongs to several professional associations including the American Animal Hospital Association, American Veterinary Medical Association, Marion Polk Veterinary Association, Oregon Veterinary Medical Association, Veterinary Dental Association, and the American Association of Feline Practitioners. Dr. Smith and her husband, Dr. Richard Hillmer, have a daughter, live with 2 cats, and a French Bulldog. In her spare time she enjoys horseback riding, cross country skiing, and running. Dr. Smith works part time now that she is semi-retired. We are blessed to still have her be part of our team. 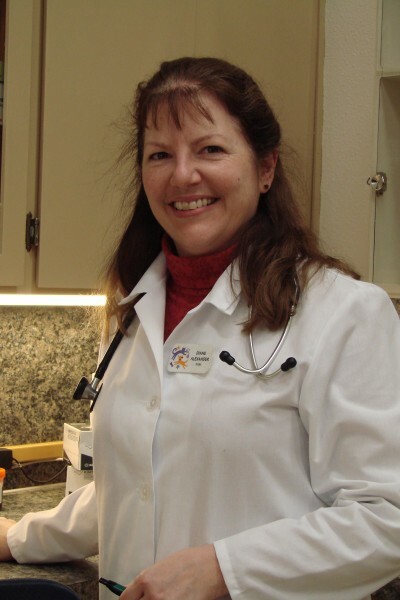 Dr. Alexander graduated from the University of Illinois, earning her degree in veterinary medicine in 1990. She fell in love with the Pacific Northwest while visiting here in 1989, and as a result, she moved to Oregon shortly after graduating to begin her practice. She practiced in Oregon City until 1999, when she established her own business, Relief Veterinary Services, and began working with various practices in Portland, Eugene, Salem and the surrounding areas, caring for patients whenever their primary doctor was away from the clinic. Dr. Alexander began working with the Oak Hills Veterinary team in 2000. Her special areas of interest include soft tissue surgery and feline and canine internal medicine. "I feel extremely blessed to be able to wake up every morning and do what I love to do!" She is a member of the American Veterinary Medical Association, Oregon Veterinary Medical Association, and Amercian Association of Feline Practioners and has been involved as a volunteer surgeon for the Feral Cat Coalition of Oregon's spay/neuter clinics since its founding in 1995. She lives in Salem with her husband and two cats. In her free time she enjoys hiking, bicycling, playing piano and working on home renovation projects. In 2017, he launched into a well-earned retirement. He is no longer practicing, and we are sure the avian patients will miss him! We wish him the best and hope he enjoys retirement!